There is no doubt that the cost of dental treatment can be a major deterrent from seeking help. Usually, there are a variety of treatment options available to fit different budgets. Financing options vary from country to country – this page covers the UK and the U.S. only. There is of course the NHS. On the whole, NHS dentistry is of adequate quality, and it is not possible to buy any cheaper. Many NHS dentists are trying to do the best they can under the restraints of NHS funding. Don’t expect to have the same choice of treatments and materials (or time) available as you would in the private sector, even if the government says otherwise. Emergency dental treatment: £22.70 (Wales: £14). This covers emergency care in a primary care dental practice such as pain relief or a temporary filling. Band 1: £22.70 (Wales: £14). This charge includes an examination, diagnosis and preventive advice. If necessary, it also includes X-rays, scale and polish and preventive care such as the application of fluoride varnish or fissure sealant if appropriate. Band 2: £62.10 (Wales: £45). This charge includes all the necessary treatment covered by the Band 1 charge, plus additional treatment, such as fillings, root canal work or removal of teeth. Band 3: £269.30 (Wales: £195). This charge includes all the necessary treatment that is covered by the Band 1 and Band 2 charges, plus more complex procedures, such as crowns, dentures, bridges and other laboratory work. Scotland and Northern Ireland are still operating under the old fee-per-item NHS system. The maximum charge for a single course of NHS treatment in Scotland and Northern Ireland is £390; some treatments will require prior approval before a dentist can start working with you. There is no charge for an examination. You can find some examples of treatment charges here. Am I entitled to free NHS dental treatment? If you suffer with extreme dental phobia, you may be able to avail of the Community Dental Service. This is provided on the NHS. Unlike “normal” NHS dentists, dentists who work for the Community Dental Service are paid an income directly by the NHS. They may not be as restricted in their choice of materials, will have more time to spend with you, and usually offer various sedation options. Community Dental Officers cater to special needs patients and, in many areas, to dental phobic patients as well. This service is not available in all areas, and waiting times may be long. It’s a bit of a postcode lottery. Our Special Needs and Dental Care page explains how to find out what services are available in your area. If you’re not having any luck, you can also try contacting your local PALS (Patient Advice Liaison Service). Feedback on PALS with regard to dental queries has been mixed, ranging from “extremely helpful” to “very unhelpful” – depending on the area where you live and the person who you happen to speak to. Why is NHS dentistry in such a mess? In 2006, a new contract for NHS dentistry in England and Wales was introduced which ostensibly was going to make things easier for consumers by introducing only 3 possible prices you will pay, depending on the complexity of the work needed (bands 1, 2 and 3). But for dentists, the new contract was a disaster. Basically, NHS dentists in England are now paid for providing a certain number of “Units of Dental Activity” (UDAs) per year (this is not the case in Scotland, where dentists are paid per item of service). Here’s the problem: within each band, dentists receive exactly the same amount of UDAs regardless of how much treatment they provide! For Band 1, they get 1 UDA, for Band 2, they get 3 UDAs, and for Band 3, they get 12 UDAs. Say for example a dentist provided a small filling for a patient, which falls into Band 2. They would get 3 UDAs for that. But say they provided 5 fillings and 3 root canal treatments which would obviously take much much longer to do and would take more appointments – they would still get only 3 UDAs. The big problem with this is that dentists are required to produce a certain (very high) number of UDAs per year, otherwise they get kicked out of the contract. Trying to get the required number of UDAs means they may have to rush things, and few have the extra time available that most people with dental fear or anxiety need to feel comfortable. 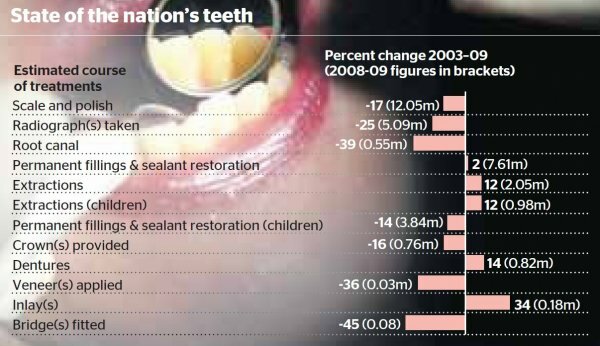 The graphic shows that teeth which in the past would have been saved with root canal treatment are now more likely to be removed, despite the advances in dentistry over the last decade. And preventive care like cleaning teeth (scale & polish) has taken a back seat, because dentists get the same number of UDAs regardless of whether they just take a quick look, or do an exam, x-rays and cleaning. You can read more about the 2006 NHS Dentist Contracts here. In December 2010, the Health Minister Lord Howe finally admitted that the UDA system isn’t working. They are now introducing three different pilot schemes in different parts of England to see which model will be used in the future. It remains to be seen whether the introduction of new models will actually improve anything, as the amount of money available per person for dental care is way too low to provide quality dentistry for everyone. The situation in Scotland and Northern Ireland is slightly different in that dentists there still get paid on a fee per item basis. However, the renumeration can be very low depending on the procedure in question, and similar caveats apply. Visit several practices until you find one that you like the feel of. You are more likely to get quality NHS care in mixed private/NHS dental practices. This is because the private patients to some extent “subsidise” the NHS patients. Some dentists view the provision of NHS treatment as a charitable endeavour of sorts. Also, in some practices there is a good balance between patients who have minimal dental needs and those who have high dental needs, and this somewhat balances out the UDAs and allows the practice to offer a higher standard of care to NHS patients. Dentists tend to start out working in the NHS to gain experience and then move into private practice. On the one hand, this may make it difficult to build up a lasting relationship with a dentist you get on well with. On the other hand, some dentists who have recently graduated will have a special interest in helping people overcome their fears, and may appreciate the opportunity to develop their skills in this field. Read the biopics on dental practice websites! In some mixed practices, more senior dentists do continue to provide NHS treatment to existing NHS patients, but new patients may be assigned to recently qualified dentists. If there’s a particular dentist you’d love to see and they provide NHS treatment, do ask if you can see that dentist – you never know your luck. If you can afford it, we recommend you go private. The advantages are that more time can be spent with you to get to know you and your fears, and you can avail of better treatments and materials. Obviously, just because a dentist is private doesn’t mean they’re any good, so shop around and get recommendations from acquaintances, friends, colleagues, family, GPs, and/or the internet. Also see what they have done in terms of further dental education (additional diplomas, courses, etc. can indicate that they have a real interest in furthering their skills and providing the best care possible). There are huge differences in the fees which private dentists charge for their services – they should have a price list available so that you can compare! Some of the differences can be explained by location, but even within the same area, price differences can be enormous. Financing Dental Treatment in the U.S.
Care Credit specializes in loans for medical/dental care. If you can repay the entire cost of your treatment within a year, you do not have to pay any interest. Care Credit are very selective in who they give loans to, and you will need a good credit rating to be approved. You still have to make a relatively small payment each month. If you do not pay the loan back in full in the 12th month, interest for the entire year is tacked on, and the interest is very hefty! So this option will only work if you can save up enough money within the year to repay in full, and if you can make the monthly payments. Initially you must be referred by the treating dentist (in order to establish an account), but most dentists are glad to do that, because the company pays them immediately for the work. The good thing about this option is that you can save money to pay for treatment over the course of a year, rather than having to pay upon completion of treatment. If you are upfront with the dentist and tell him/her about your financial situation, you may discover that the dental office offers patients a payment plan. It is always worth asking about this! If finances are tight, you may want to look into local dental schools. You will be treated by dental students, who perform the treatment closely supervised by their instructors. Expect to pay about 20% – 60% of what you’d pay for the same treatment by a private dentist. On average, it’s about a third to half the cost, but this varies quite a lot from state to state. Some dental schools have a graduated program based on the patient’s income – ask for their fee schedule to find out more. Quality of treatment is generally excellent to superior, with the student getting checks at various points in the treatment. Patients appear to be generally very happy with chairside manner. You can get free consultations with every dental specialty. Each appointment takes much longer because of the instructor checks, and because it takes practice to become fast at dentistry. There can be long waiting lists. Treatment may be very drawn out, over several years. The students at times stand in line waiting for an instructor. You can’t choose your dental student. You may be treated by more than one person. Your mouth may be looked at by a dozen different people. To find out how happy patients at your local dentist school are with their treatment, you could schedule a consult (with the dental school), find out where the patient waiting area is and start asking questions of the patients that are being treated there. To locate and get more info about dental schools near you, try wikipedia’s List of Dental Schools in the United States by State. Fee-for-Service plans are best. They allow you to choose any dentist and you get reimbursed according to dollars spent on dental care. This means that treatment decisions are not influenced by the dental plan – unlike Dental Managed Care Plans. Dental Managed Care Plans come in two subtypes: DHMO (short for “Dental Health Maintenance Organization”, and also know as DMO or dental HMO) and PPO (short for “Preferred Provider Organization”). you can’t freely choose your dentist. it may encourage undertreatment (ignoring problems), because the dentist gets paid regardless, and it doesn’t make financial sense to perform (or put much effort into) treatments that are covered (such as simple fillings and prophy). treatments which require co-payment may be encouraged even though they are not indicated (e. g. crowns instead of fillings, or deep cleaning instead of a standard cleaning), because that’s where the money is. appointments may be very short to fit more people in, or there may be long waiting times both for the appointment and in the waiting room. The above is not to say that “HMO dentists are bad” – merely that finding good care with a DMO plan is harder because of the way the system works. PPO programs are better than DHMO. These are plans under which patients select a dentist from a list of providers who have agreed, by contract, to discount their fees. In PPOs that allow you to choose a non-participating dentist, you will be penalized with higher deductibles and co-payments. If you have a PPO plan which allows you to freely choose your dentist, you shouldn’t base your decision on who’s on the list. Pick someone you think is right for you – if s/he happens to be a provider, all the better – the difference in what you’ll save is usually minimal. Be aware that some services may be either poorly covered or not covered at all by your insurance company, and every insurance plan has its own exceptions, limitations, maximums, and fee schedules. For example, very few insurance companies cover implants, even though implants are often a more conservative and better option than bridges. Let your dentist explain the pros and cons of your options, and try and base your decision on what’s best for you in the long run (as long as you can afford it), rather than on what’s covered by insurance. This may mean having to space treatment out a bit. Due to the decline of traditional dental insurance over recent years, discount dental plans have become quite prevalent. Dental discount plans are also known as “referral plans”. You pay 100% of the rates negotiated by the dental plan company directly to your dentist – these discounted fees are about 10% to 60% lower than what a dentist normally charges, depending on the procedure and materials in question. The dentist gets paid 10% to 60% less than they normally would, and the difference goes to the dental plan provider, for acting as the referral agent. Some dentists participate simply because there is a lot of competition in their area and if they’re starting up a new office, they may feel forced to participate in dental discount plans to get new customers. Some dentists take discount plan patients hoping they will refer their next-door neighbors at full fee. In these cases, dental plans may work to your advantage. run a production line, where they’re chasing from patient to patient, to make up for the losses through sheer volume. recommend more expensive and/or more extensive procedures than necessary. That’s the rumor, anyway. The net result could be that you pay more than you would’ve done otherwise. some may bait-and-switch you to non-covered procedures. some may cut corners to get their overhead costs lower. some do not have enough patients to pay all their bills and will do anything to get warm bodies in the door. It has been alleged that most offices will not provide the highest level of care under discount plans. Dental plans come with a membership card and a complete list of all dental procedures covered and what the discounted price will be. Unlike with dental insurance benefits, there are no claim forms, pre-existing condition checks, or paperwork hassles. Be aware that some of these plans don’t give you the list of participating dentists until you have signed up. If you do decide you’d like a discount plan, you should choose it based on which plans the dentist of your choice accepts, NOT the other way round (don’t take out a discount plan and then see which dentists partner with that plan!). In the United States and Canada, you can call 211 to get information and referrals to relevant health, human and social service organisations. Explain your situation and see what options may be available to you from local and national social service programs, governmental agencies and non-profit organizations. Medicaid-eligible people under the age of 21 are entitled to Medicaid Dental Coverage in all U.S. states. For people aged 21 and older, it varies from state to state. Most states provide at least emergency dental services for adults. Try calling 211 to see what services are available in your state. Some communities have low-cost health clinics or similar whose services also include dental care for people with limited resources. The Bureau of Primary Health Care, part of the Health Resources and Services Administration, has federally funded community health centers that provide dental care. A call to your local health department or 211 might give you additional leads. For victims of domestic violence there’s a scheme called “Give Back a Smile”. The Mission of Mercy also hold nationwide events where free dental care is provided. You can find a list of upcoming free dental clinics here. If you are elderly, disabled, or medically compromised, try the National Foundation of Dentistry for the Handicapped (NFDH) website, where you can find contact numbers and addresses for donated dental services in your area. More detailed information is available on our Special Needs and Dental Care page. Eldercare Locator is a service provided by the US Admin. on Aging. The site is designed to connect seniors with local resources (health, housing, care giving, SNAP, etc.). If you search by zip code it will show the local offices nearby. Remote Area Medical (RAM) Events: “I volunteered with RAM a couple years ago when they came to my city. My role was helping get people checked into the clinic. We only asked for general information. No ID was required, we gathered no insurance information and there were no restrictions. RAM events are open to anyone that shows up, including people from outside the county. For this reason they can get busy so they recommend showing up early.” (from our message board). You can find upcoming RAM events here. Got a skill or service you can barter with? Tell or write to dentists in your area what you can provide in return for dental treatment, or as a part payment. Examples might include landscape design/gardening, website design, building/carpentry/plumbing, or anything else that would otherwise cost big bucks. There may be family members who are willing and able to lend you the money, or offer you a part time job. You may want to open a savings account and draw out what you need to pay your dentist. He or she may even give you a percentage off for paying in full at the time of your appointment. You can work out a treatment plan with your dentist which allows you to space out treatment over a considerable period of time, and pay as you go along. The same goes for some of the other options on this page. Dentists may offer fee reductions (usually about 5%) for payment in advance or at the time of treatment, if you ask them. The information on this page has been provided by the Dental Fear Central Web Team. Last updated on April 21, 2019. We welcome your feedback on our information resources.